John Joseph "Rock" Rokisky (July 24, 1915 – November 28, 1993) was a professional American football end and placekicker who played three seasons for the Cleveland Browns, Chicago Rockets and New York Yankees in the All-America Football Conference (AAFC). Rokisky grew up in West Virginia and attended Duquesne University in Pittsburgh, Pennsylvania, where he was a standout as an end and kicker. After a stint in the U.S. Navy during World War II, he joined the Browns in 1946. The Browns won the AAFC championship that year. Rokisky was sent to the Rockets in 1947 and to the Yankees the following year before leaving football. Rokisky grew up in Clarksburg, West Virginia and played as an end and a placekicker at Duquesne University in Pittsburgh, Pennsylvania beginning in 1939, when he was a sophomore. He scored nine points that year in an upset of the University of Pittsburgh. In a December game against the University of Detroit Mercy Titans, he kicked an extra point to tie the game at 10–10 and preserve Duquesne's unbeaten record. The Duquesne Dukes finished the season undefeated and were ranked eighth in the nation in the AP Poll of the best college teams. After the 1941 season, he was named an All-American by Collier's. At the end of 1941, he played on an eastern all-star college football team, one of three all-star squads he made during college. After he graduated from Duquesne, Rokisky joined the U.S. Navy's Seabees, a construction battalion. He played football for a military team at Camp Peary in Virginia and was selected to play on the Navy's all-star team. Rokisky was drafted in 1942 by the Pittsburgh Steelers of the National Football League, but did not sign with the team as he continued his military service. In 1946, following his discharge from the Navy, he signed with the Cleveland Browns, a team under formation in the new All-America Football Conference (AAFC). He was the 21st player signed by the team. 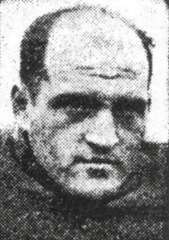 Paul Brown, the coach of the Browns, placed Rokisky on the team's inactive list in October to make room for the addition of Bud Schwenk to the team's roster. The Browns went on to win the AAFC championship. Rokisky played in 1947 for the Chicago Rockets as a kicker, and moved in 1948 to the AAFC's New York Yankees before leaving professional football. He died in Wintersville, Ohio in 1993. ↑ "Pitt Toppled By Duquesne". Reading Eagle. Associated Press. October 21, 1939. p. 11. Retrieved August 6, 2012. 1 2 "Sub End Halts Panthers' Rush". Cleveland Plain Dealer. Pittsburgh, PA. International News Service. October 22, 1939. p. C1. 1 2 "Rokisky's Kicks Save Duquesne". Cleveland Plain Dealer. Pittsburgh, PA. Associated Press. December 3, 1939. p. C1. 1 2 3 4 5 6 "Ex-Duquesne Star Signed By Browns". Cleveland Plain Dealer. February 13, 1946. p. 18. ↑ "Rokisky On Collier's Team". Pittsburgh Post-Gazette. New York. December 5, 1941. p. 19. Retrieved August 6, 2012. ↑ "Fordham Works For Sugar Game". The News and Courier. International News Service. December 28, 1941. p. 10. Retrieved August 6, 2012. ↑ Piascik 2007, p. 29. ↑ "Fekete Is Slated For Coast Action". Cleveland Plain Dealer. October 30, 1946. p. 19. 1 2 "John Rokisky NFL Football Statistics". Pro-Football-Reference.com. Archived from the original on October 6, 2012. Retrieved August 7, 2012.